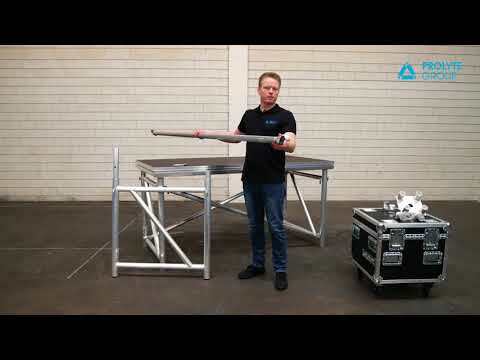 Creating a support construction for any stage always meets strickt demands. Coping with short production times, systems like this need to be fast to build and easy to assemble. The Easyframe D offers both, a lightweight pre-build frame connected with two diagonals to complete the set-up. No tools are needed to mount the frames. The frames can easily be connected with either a 2- or 4-way leg adapter. The EasyFrame D is a support frame for both in- and outdoor use. The system is constructed of 60 x 5 and 48,3 x 3 mm aluminium tubes and is used to create stages ranging in height from 110cm. to 150cm. Spindle feet, placed in the bottom of the frames, make it possible to level the stage at an exact position. EasyFrame D is designed to be used with standard StageDex decks, the allowable loading is 500kg/m2. A deck of your choice can be placed on the frame.